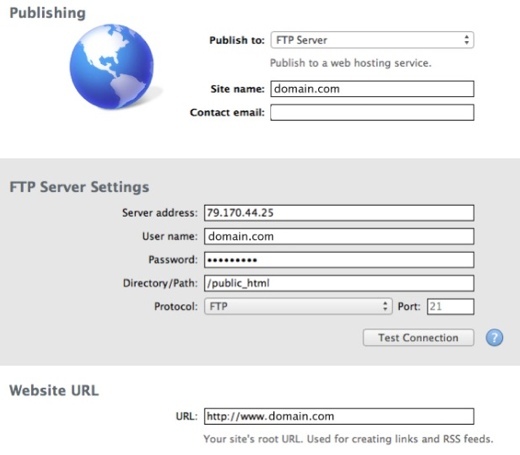 After you have created your website with iWeb ’09, you need to know how to upload a iWeb ’09 website to our web hosting using iWeb 09 built-in FTP capabilities. Make sure your FTP lock is open. From the main iWeb Screen screen, go to File > Publish >. In the “Publish to:” drop down select Publish to FTP Server . or the FTP IP address supplied if your domain is not yet live. Enter your FTP User Name (the domain name) in the “User name:” field. Enter your FTP password (as supplied in your welcome email) in the “Password:” field. If all your details are correct, upload. Please see the attached screenshot if you need visual assistance.